I'm all about that summer glow. I want to look good but natural and have myself wondering 'Wow, do I really look that fresh?' every time I look in the mirror. It's been an uphill struggle for me to find exactly what works for me but as I've mentioned time and time again, I'm committed to adding staples that I truly love to my regime to keep myself looking good as often as I can. When it comes to summer beauty, it's been hard for me to find the balance. Of course, I want to keep my face and body as fresh as possible and I also want to look nice without having makeup melting off my face. One thing's for sure, since we've been graced with the glorious (and sometimes ridiculous) British summer time, gone are the days of heavy moisturiser and full coverage foundation, I'm finally allowing my skin to breathe but still look as healthy as it can. Before I went to Las Vegas, I reflected on a similar post I wrote last year and how my wants and needs have changed. My want isn't only for great makeup but for great skin to go underneath so this year I've switched it up and tested a few different products that have really hit the spot so much so, they're now essential to my daily regime. Dew The Hoola, Benefit Before we start breaking old habits, you should know that this is still a huge part of my summer makeup bag. It's brilliant for makeup and no makeup days and I don't I'll ever get tired of how effortlessly it blends into my skin. It adds the perfect flush of colour without the need to sit out in the sun or use fake tan. I'll definitely be using this right through to Autumn. 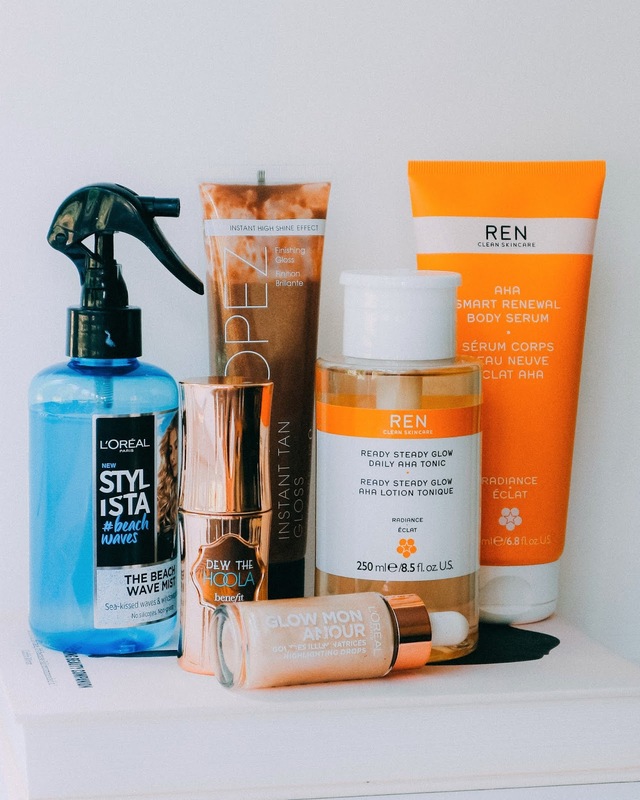 Ready Steady Glow Daily AHA Tonic, REN Clean Skincare* If you've been following my skincare trials and tribulations, you'll know that exfoliating tonics have been a recent addition to my regime. I've been using this one from REN every evening and a few mornings and I can only scream about how it makes such a difference to my complexion. I often suffer from sensitive skin but I don't find any red patches after using this and don't experience any stinging during application. My makeup has applied so much smoother since using this and I can't wait to see what more it can do. Instant Tan Finishing Gloss, St Tropez Fake tan maintenance has never been my thing, especially in the summer months, so this has been the perfect alternative. I caught the sun a little while I was away so adding this to my chest, shoulders and arms before heading out has been a great way to keep my skin looking dewy while adding a no fuss tint. It goes without saying that you need to wash it off of an evening to avoid the inevitable stained sheet fiasco but it's nothing a quick rinse can't help with. AHA Smart Renewal Body Serum, REN Clean Skincare* Another product that has really changed the game for me is this body serum. It's a lotion consistency, smells absolutely incredible and I can't believe how light yet moisturising it is on my skin. Miraculously it makes my skin tone look more even and, like the tonic, I find it's kind to my sensitive skin which is bloomin' brilliant if you ask me. Glow Mon Amour Highlighting Drops, L'Oreal No summer makeup bag is complete without some highlighting drops. I mentioned these back in my L'Oreal No Makeup post and I still stand by the fact they're so versatile and that they still work wonderfully on my skin. Since the weather has been warmer I've been using them on their own or adding a very small drop to some CC cream before application. I didn't realise before but wow, when the sun hits them, they really shine. Such a good staple, highly recommend. The Beach Wave Mist, L'Oreal Although it's not strictly beauty, I'm mentioning this because it's been one of my favourite hair essentials to use over the past few months. In my post about styling short hair I touched on how this is one of the finest salt sprays I've tried and every time I use it, I'm fascinated by how it does such a great job without making my hair feel crap and crispy. It's such a lovely addition to my hair care routine and I actually get excited to use it whenever I feel like styling my hair. I'd love to know what your favourite glow-to (yes, you read me right) products are for the summer season. Do you switch up your regime at all? What products do you swear by?